Essential Question: How do artists communicate identity through visual art? I Can . . . I Will . . . When you have completed your box click on the button below, download the rubric, and assess your artwork. Upload the RUBRIC and the PHOTO of your artwork to Schoology. For this project, you will be creating a self-portrait that reflects your personal culture by creating an identity box. Your goal is to create an artwork that tells the viewer about your identity. You may use any of the information you found when creating your mind map or you can add some new ideas. The end result should tell someone something about your personal culture. We will be using part of a MacAir box, either the lid or the base. You may include an assortment of images, words, objects, artifacts, pieces of music, photographs, items of significance to you (or images of them). You can tape, glue, or loosely place these items in your box. Paint, draw on or cover in collage (inside and out) all sides of the box. You must also include your image as part of your design. It can be a photograph, silhouette, an avatar, etc. Your image should be integrated into the final design so that it feels like it belongs in the design. 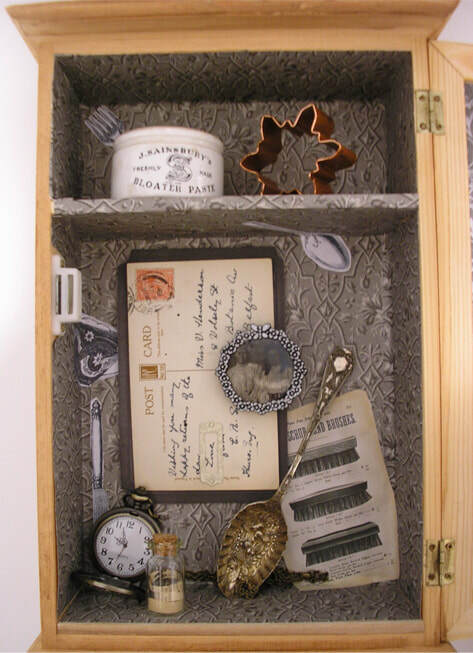 The box must include 4 objects that are meaningful to you, such as medals, ribbons, coins, programs, ticket stubs, old sunglasses, trophies, and found objects of all types. You will also need to name the artwork. 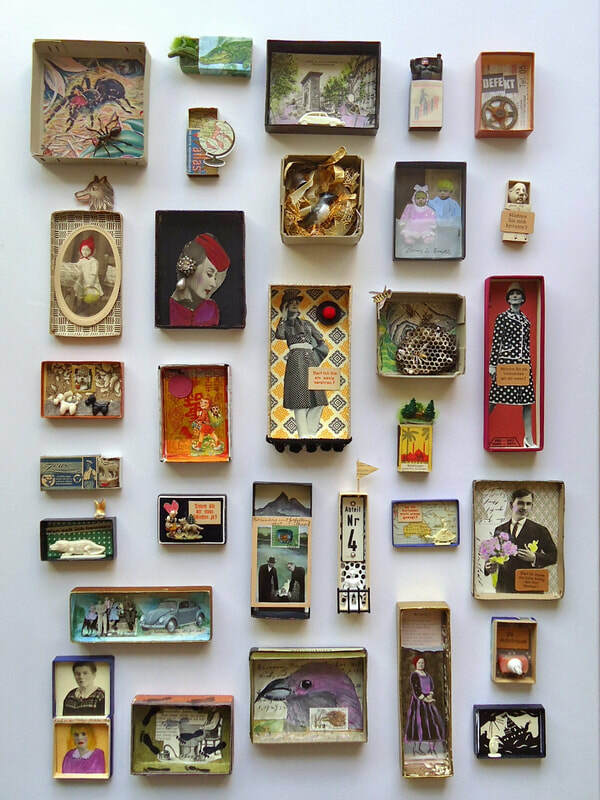 assemblage: A three-dimensional composition that utilizes a variety of materials both found and original. collage: The technique and resulting work of art in which fragments of paper and other materials are arranged and glued to a supporting surface; also, the resulting work of art. identity: The distinguishing characteristics that determine one’s self. portrait: A portrait is a painting, photograph, sculpture, or other artistic representation of a person, in which the face and its expression is predominant. self-portrait: An individual’s representation of him- or herself. symbol: Something that represents or stands for something else, either in pictorial or textual form. metaphor: something used to represent something else; emblem; symbol, including intangible concepts. representational: Depicts an object in nature in recognizable form. caricature: A rendering, usually a drawing, of a person or thing with exaggerated or distorted features, meant to satirize the subject. narrative: A spoken, written, or visual account of an event or a series of connected events. Save your narrative as a PDF and submit it to Schoology. Write a clear statement that addresses who you are, your values, goals, commitments, and your relationship to your family, school, & community. Make your statement a true representation of what you stand for and who you are. Proofread your mission statement carefully so that you eliminate errors in grammar, spelling, or vocabulary use. It should be from 150-250 words long, but no more. Please include any symbolism you used in your work to give the viewer a clearer understanding of your visual choices. Think about your own life, where and who you are now, what you value as you write.... Remember, you can include your future dreams and goals. Symbolism can be found through out all of mankind history, including in many works of art. A symbol in art is a visual image that has a secondary meaning beyond its physical appearance. For example, the butterfly in religious paintings often means transformation and represents resurrection. The caterpillar's metamorphosis from the chrysalis (grave) to a beautiful butterfly is associated with Christ's resurrection from the dead. Please watch the video below. It describes some of the symbolism found in this painting by Jan Van Eyck, The Arnolfini Portrait. Symbolism will varying different cultures. religions, time periods, and peoples. These visual symbols may remain constant over thousands of years or change along with the culture. You may choose to use existing symbols that will help tell your visual story or create symbols of your own. Remember that you are trying to convey your identity in a way that people will have a better understanding of who you are. 2. The outside of box should show how you represents yourself to the outside world, Inside of the box should be personal mementos, and other symbolism of 'inner strength'. 5. Don't be afraid to get creative and do unique things to your box. For example, you may cut out a window. Before turning in a rubric, ask 3 people for a positive and a needs some work suggestions.